In the high-stakes volleys and counter-volleys to determine whether or not NFL Concussion Settlement claims can be audited multiple times, both Claims Administrator Orran Brown, and Pat Tighe of X1 Law have submitted final briefs to the Court. I wrote about the cycle of audits described in the X1 motion here and Mr. Brown’s defense of the audits here, and his amended reply here. The fiery response by X1 Law submitted on April 1 completes the briefing and now awaits a hearing or decision at the discretion of Judge Anita B. Brody. Tighe quickly points out that none of the authorities cited by Brown point to multiple audits, but rather an initial and presumably single audit. Though Brown points to numerous authorities, each one either explicitly or implicitly referred to a single, first (and presumably only) audit of a claim. Tighe points out Brown’s failure to correct numerous misstatements of fact regarding X1Law and his portrayal of advocacy as dissention. These attorneys are doing exactly what attorneys are supposed to do and even required to do in accordance with the American Bar Association’s Model Rules of Ethics, and that is to zealously advocate for their clients. 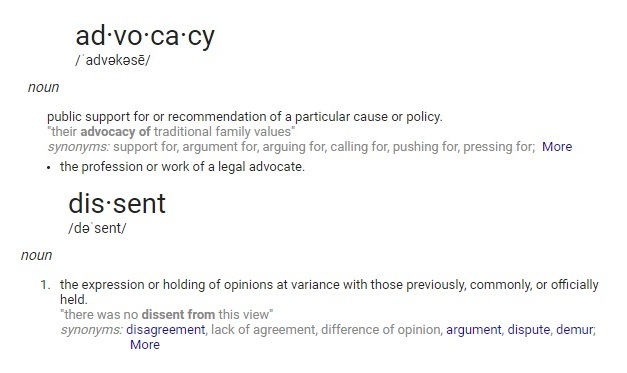 In viewing the dictionary definitions of these words, Orran Brown, and sometimes even the Court’s apparent views of dissent are troubling. If the norm is to not advocate for one’s client, then a serious flaw in both the claims process for the settlement and the larger judicial environment is of serious concern. Many class members have been critical of Chris Seeger because during settlement negotiations he promised the moon, or close to it, and gave tired and sick players hope that they would soon have the relief they sought only to find themselves in a hellscape with few visible advocates. This lack of transparency is troubling. The courts belong to the people and the settlement belongs to the class of retired players and their families. It is of both public and private interest for these interactions to be conducted transparently, although the reasons for not doing so can be summarized in these statements from University of Georgia Law Professor Elizabeth Chamblee Burch’s article Monopolies in Multidistrict Litigation. In short, a public show of dissatisfaction expressed through client advocacy can be damaging to one’s career. 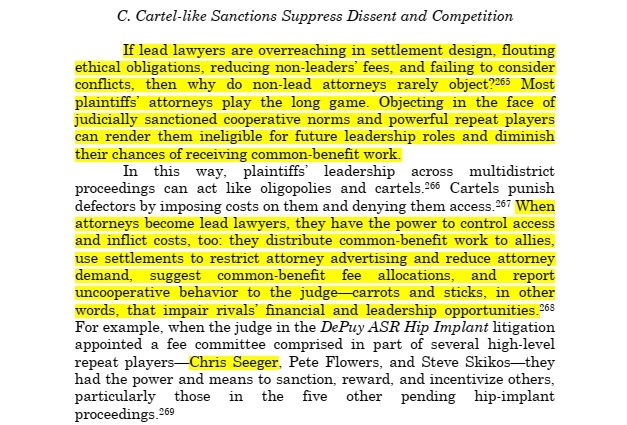 While Seeger is considered part of the top-tier of the plaintiffs’ bar, apparently even he doesn’t feel comfortable in publicly challenging a defendant and creating tension within the courts. According to University of Connecticut law professor Alexandra Lahav, in her book, In Praise of Litigation, judges are evaluated on their efficiency more than other aspects that are of value to the public. She notes that in many non-class certified MDLs, even the settlement agreement is not made public, yet settlement is the favored method of resolution. This lack of transparency has seemed to spawn a culture that desires to keep comments and criticisms minimal and private. This seems to be the only reason that Judge Brody, as other judges have done, requires that most controversies take place on a private portal rather than the public docket, lest her own efficiency is called into question. With these things in mind, it is little wonder that Seeger shows very little visible support for those who dare to file their grievances publicly. Unfortunately, this shadow culture often leads to less than optimal benefit to the plaintiffs the lawsuits were filed to vindicate and compensate as noted by Professor Burch, citing the Propulsid litigation. While the NFL settlement has not been quite the scourge Propulsid was, two of the same principles are in play; that of a class attorney who negotiated fees disproportionate to claimant relief and that of a very strict claims process that limits compensation. Add a claims administrator who seems all to happy to do the defendant’s bidding, painting advocacy as dissent and forcing plaintiffs to defend their diagnoses against claims of fraud in an endless loop rather than forcing the NFL to refute the claims with clear and convincing arguments more substantial than mere speculation and rogue internet searches and you have the recipe for a 65-year disaster. Tighe points out Brown’s misrepresentations as he clarifies that he is only asking the court to administer the settlement as written. He also reminds the court that when settlement language has been questioned previously, Her Honor refused to budge from the clear language. In most instances, this has been favorable to the NFL, as in when a class member through no fault of their own was unable to obtain CTE pathology within the settlement designated time frame or those who’ve asked for other accommodations due to extenuating circumstances. We now wait to see if she will make a similar determination that favors the class. Aside from the questionable legality of Brown’s implementation, Tighe also points out that the claims administrator relies on many “factually incorrect” assertions to argue in favor of multiple audits of the same claim. 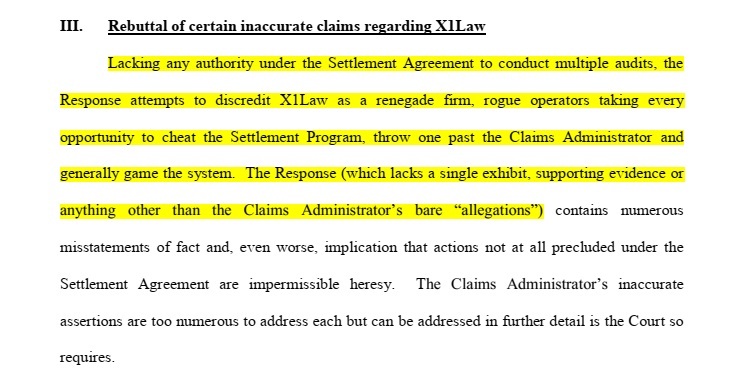 He holds that the claims administrator has mischaracterized his firm as a “renegade” while lacking factual evidence to back his claims. Tighe points out that while he presented the court with numerous factual exhibits, Orran Brown has offered none. 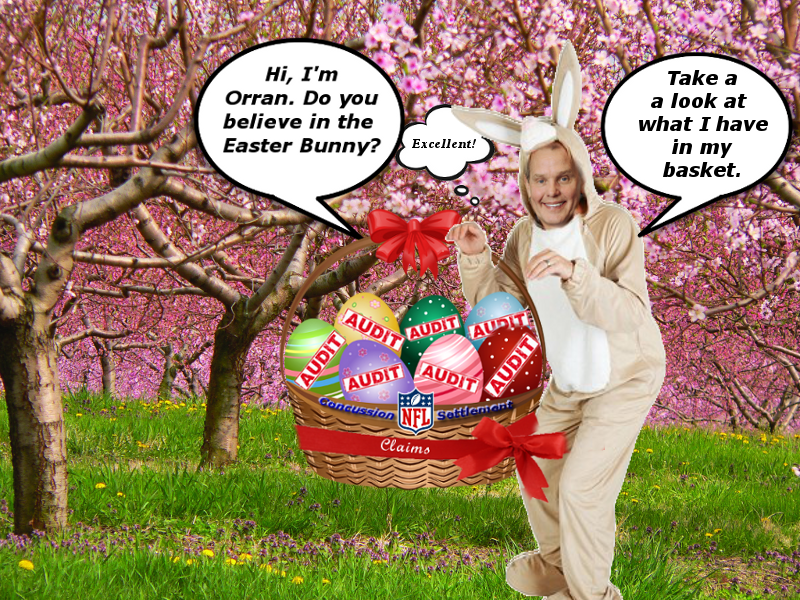 Tighe’s rebuttal goes into detail regarding the ways he says his firm has been mischaracterized, some of which I alluded to in my article on the “The Transformation of Orran Brown.” One of the major allegations asserted by Brown is that X1 changed major elements of claims, necessitating another audit, but Tighe refutes this. Tighe requested an evidentiary hearing should the court see relevance in Brown’s arguments. Elsewhere in the response, Tighe pointed out other manipulations by Brown and requested an evidentiary hearing should the court have concerns. 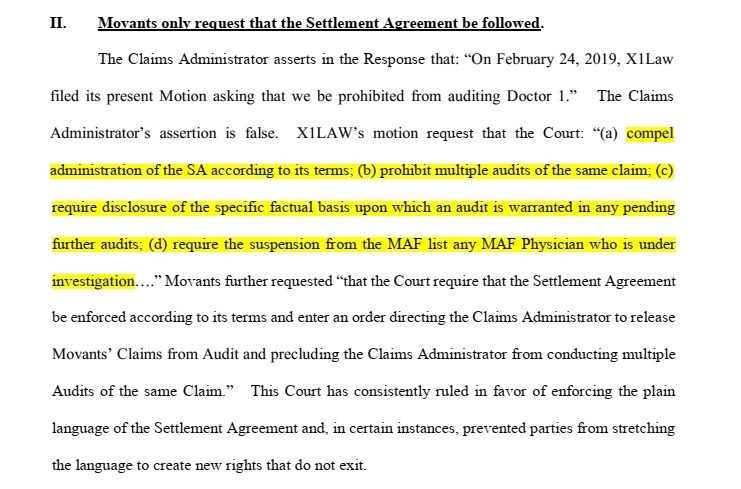 One of the more troubling accusations hurled by Brown as improper in X1’s recommendation of a doctor to serve in the MAF program. As Tighe points out, attorneys representing players were contacted by settlement administration asking for recommendations; it should therefore not be considered improper when an attorney complies. As I wrote previously, this seems to be a recurring theme with indications that new MAF physicians are being added through NFL-friendly AAP recommendations, and gives pause to wonder in retrospect if attorneys were queried for recommendations as a method of eliminating doctors for consideration as opposed to adding them. In short, the procedures Brown defends and Tighe opposes seem to now define the settlement that once brought a flood of hope to suffering retired NFL players and their families. I was contacted by a member of a player’s family a few days ago, who related that the player was deeply discouraged by the endless hurdles and difficulties in even presenting his claim. Though he receives NFL disability based on neurocognitive issues, he was advised to proceed through the BAP and failed to receive a qualifying diagnosis that he can submit. I tried to explain how this is not the end of the line and that he should not feel singled out. All indicators point to a legitimate neurocognitive issue, however since the time for submitting pre-effective date claims has expired, it is likely that the player will have to be reexamined by a MAF physician, and the small things that the BAP in its rigidity failed to accommodate would need to be clarified upon reexamination and submission of a claim. The claim would likely be audited. Hopefully, if Mr. Tighe prevails with his motion, only once. If not, he might have to endure multiple audits, each time defending why his diagnosis is legitimate. Many players give up and this seems to be part of the NFL’s strategy. Claims are being paid, but no one, outside of possibly the smaller segment of claimants dealing with neuromuscular disease, has a quick, or easy road. It takes a great deal of time, effort and perseverance to see a claim through to issuance of a monetary award. It’s truly a shame that men who have difficulty concentrating, remembering details and deadlines, and often expending a great deal of mental energy just to cope with the everyday, are being forced through the torturous process. I hope that they and their families will stay the course, however, because I do see light at the end of the tunnel for those who do manage to navigate the treacherous obstacle course hurled in their paths. If only the NFL, for once, would show some integrity and treat the men who built their empire with compassion instead of contempt, the obstacle course wouldn’t exist. Sadly for all involved, it seems the reactionary league has not yet grasped that its existential threat is not brain injury in and of itself. While the game should be made safer, it will never be safe, and in the end, its measure of sustainability rests in how well those who are damaged are cared for.